MyMemories Blog: Meet this week's Featured Designer - it's KapiScrap & Design! Meet this week's Featured Designer - it's KapiScrap & Design! Let me introduce myself to those of you who don’t know me yet. My name is Sandrine aka KapiScrap. I am French and I’m living in the South West of France. I created my own company in 2000. I work in the development and testing (quality) software area. Three years ago I created KapiScrap & Art, which focuses on the digital scrapbooking industry. If memory serves, I discovered digital scrapbooking at the end of 2009. 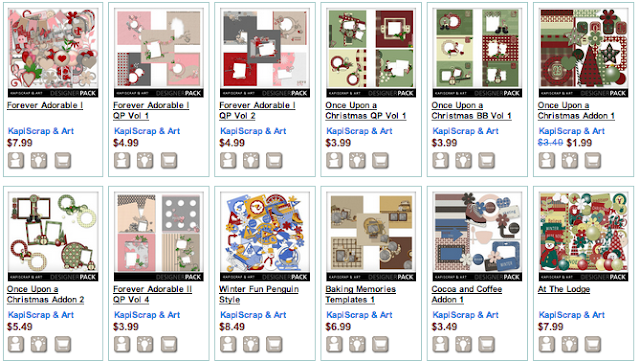 KapiScrap & Art has designed a great collection of kits based on various themes (baking, vacation, kids, holidays…) and with different styles, ranging from vintage style kits like Baking Memories and Once Upon a Christmas to whimsical and more colorful kits like Winter Fun Penguin Style and Tropical Holidays. Before starting to draw the items of a kit or to create the papers, I think a kit as a *whole*: the style, the palette, and I list all the items. We are two people designing at KapiScrap, so we often share the tasks as we draw everything from scratch and some items require several hours to be designed. So be sure to visit her shop this week and pick out YOUR favorite!! Comment below and let her know what it is and YOU could be one of TWO Lucky Ducks who each win a kit of their choice from her shop!! Here's a few of her fun kits!! Be sure to visit her MyMemories shop to see them all! Enter the promo code below to save 25% off any purchase from her shop THIS WEEK ONLY! Visit her blog and Facebook pages too for even more fun goodies!! My favorite kit is Baking Memories! What beautiful kits the colors and artwork are amazing! I have several favorites so it is hard to say which one is at the top but I am going to go with Spooky Hallow. Beautiful kits. I love the Baking Momories kit. Such pretty colors. Love all your kits. Your elements are so unique. The elements are unique to Sandrine as they are all hand drawn. Amazing talent. She really thinks outside the box to bring us new and exciting things. I like Color Me Fall. Wow, that's really hard to choose one kit as a favorite. But I really adore the Tropical Holidays with a very cute fish and shiny sun. And my second favorite is Baking Memories. i love the ABC 123. so perfect for everything! Hello! TYSM for your nice comments! It's a pleasure to read them. So good luck to everyone! Congratulations to craftsbyreva and Ka77hy. Hope that you'll have fun with the kit you're going to choose!